I started to think more intensively about Ellenberg indicator values issue at one conference while listening to the presentation, where a colleague used mean Ellenberg indicator values as explanatory variables in constrained ordination. I considered this as a kind of statistical heresy, perfect example of circularity of reasoning – you take your vegetation data, calculate mean Ellenberg indicator values for each plot, and in turn use these mean values to explain the original data. But it’s tempting – mean Ellenberg values are often considered as good proxies for measured environmental variables, and they are easy to calculate, so using them as explanatory variables is attractive. I tried that – I took a dataset with measured soil pH and calculated mean Ellenberg values for soil reaction, and compared how much variation in species data will be explained by pH and how much by mean Ellenberg; Ellenberg was a way better predictor than measured pH. Ok, so here we have the consequence of circularity. 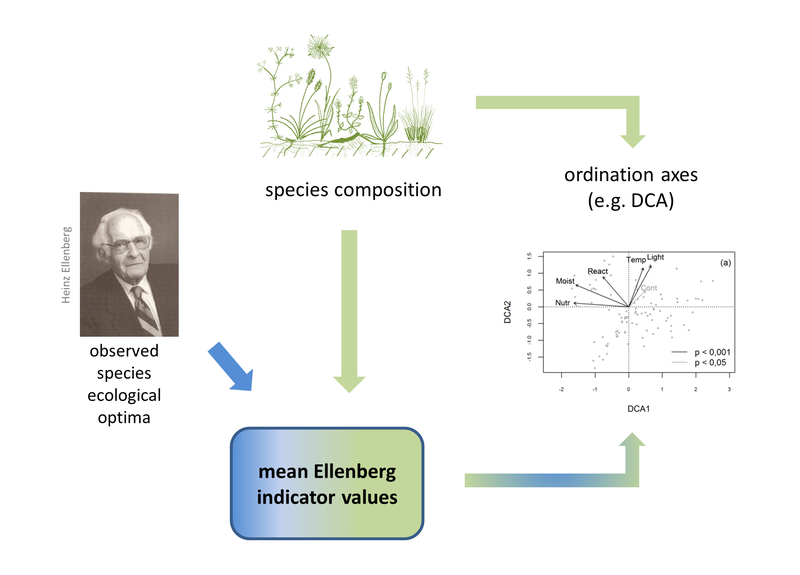 Thinking it through, I concluded that the reason is that mean Ellenberg values carry legacy of the species composition, from which they were calculated – if two plots have the same species composition, their mean Ellenberg values will be identical (considering mean not weighted by species covers), and if the species composition differ a bit, Ellenberg will change just slightly (changing one or a few numbers while calculating the mean doesn’t change the result too much). I wondered what would happen if I reshuffle species Ellenberg values among species before calculation of mean for the vegetation sample, or if I replace the original species values by randomly generated ones. This would remove ecological meaning of the values, but keep the side effects of calculating the mean. No wonder – mean of randomized species Ellenberg values explains still more variation, when used in constrained ordination, then does random numbers (just keep in mind that every, even randomly generated variable, explains some variation – if this doesn’t make you happy, consider using adjusted R2 instead). There is no ecological information in these randomized values, so the extra explained variance is the legacy of species composition imprinted in mean Ellenberg values. I used randomization of species values as a base for modified permutation test, which can be applied for correcting the issue – not necessarily in constrained ordination, in which mean Ellenberg values are rarely used (scanning JVS and AVS journals through last ten years returned two papers), but also in unconstrained ordination, when mean Ellenberg values are correlated with ordination axes and the correlation is tested (actually this treatment is fairly common, although the problem with circularity of reasoning is exactly the same, yet not so obvious, as in constrained ordination). I wrote an R code and later also a simple clicking program (MoPeT) running in R and calculating modified permutation tests, which is otherwise not easy to do. I presented the results in 2009 IAVS in Crete and later published a paper in JVS, together with André Schaffers, who helped me a lot in sorting the ideas and writing the manuscript. Still, I am not sure if ever somebody will really use this routine – mean Ellenberg values are great for description, but it’s perhaps better to keep them away from more sophisticated statistical treatments. The story has actually an unexpected follow up, although I hoped that I won’t touch Ellenberg values any more. As a parody of life, I am just working on a paper describing statistical way how to justify the use of mean Ellenberg indicator values as explanatory variables in constrained ordination, and even do such things like partitioning the variation among different Ellenberg values or between Ellenberg values and measured variables. I presented this topic on EVS workshop in Vienna this spring, where it went through without any feedback – I guess the audience was even a little disgusted by such an overly technical talk. I really don’t feel like convincing somebody to use mean Ellenberg values as explanatory variables in constrained ordination, but I can’t help feeling quite fascinated by the imagination that something like this is actually possible. This entry was posted in about research on September 23, 2012 by David Zelený.